The River Of Grass Greenway (R.O.G.G.) sounds eco-friendly but the proposed hard surface bike path is anything BUT green. Supporters of this project have waged an all-out campaign to “greenwash” the reality of it and mislead the public. The feasibility study and master plan are what’s available to evaluate the proposed project on. After exhaustive evaluation, it’s clear this project has many problems on many levels. 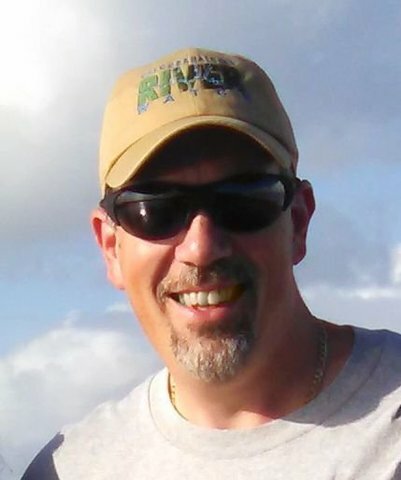 I fail to understand how anything that would destroy wetlands, disrupt watersheds, disturb view sheds, fragment critical wildlife habitat, encroach on indigenous lands, desecrate burial grounds, disturb historic battlefields, undermine Everglades restoration and result in commercial development of the Big Cypress National Preserve and Greater Everglades could even get this far. Protesters march against the R.O.G.G. in April 2015. Photo courtesy of JohnBob Carlos. Supporters claim it’s still merely an idea and that we’re drawing conclusions or distorting facts if we oppose it. Well if not now, when? We must stop this wastefully expensive “idea” NOW before it goes any further. Over a million taxpayer dollars have been spent to produce a glossy, professionally bound 11x17 full color version of this “idea”, which offers little benefit to anyone but a small group of cyclists and whoever would build and operate it. It seems there’s a lot of money to be made destroying the Everglades. Over 800 miles of paved and unpaved paths already exist in the Everglades, most notably Shark Valley and Loop Road. The public can already get unobtrusively up close and personal with the Everglades’ nature and has been able to do so for quite some time. The notion that access doesn’t already exist is blatantly false. 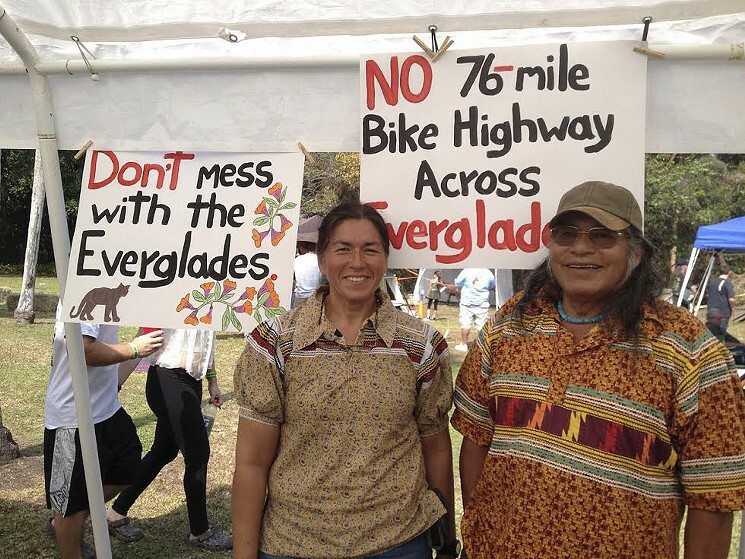 Betty Osceola and Bobbie Billie protest the R.O.G.G. It’s outrageous that taxpayers would be forced to pay $211 million to construct this unnecessary project and an astounding $3.620 million annually for operating and maintenance costs, three million of which is for shuttles and transit. How is that sustainable? Construction and operation of the ROGG will certainly produce large amounts of carbon emissions. The most sustainable solution would be NOT TO BUILD IT! Moving clean, fresh water south into the Everglades in large quantities (which isn’t currently happening) helps stave off the effects of sea level rise and saltwater intrusion. Building a hard surface bike path (a road) near Tamiami Trail creates yet one more barrier, undermining current restoration efforts. The 76 mile path would have a footprint of over 140 acres, at least 100 of which would be undisturbed and sensitive habitat that would be destroyed as it’s paved over. New bridges would have to be built as existing road bridges cannot be used, destroying more pristine habitat, both aquatic and land based. The Big Cypress National Preserve and the Everglades are World Heritage Sites and designated Outstanding Florida Waters. 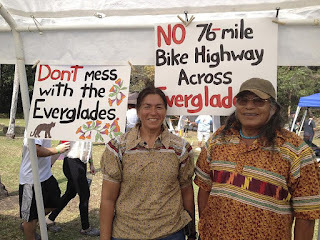 If you love the Everglades, you should oppose this project. The petition created by Rails-To-Trails Conservancy has garnered over 2,500 signatures from supporters. The petition opposing the project (http://bit.ly/roggpetition) has garnered over 4,500 signatures. There is also a sign-on letter for organizations and businesses (http://bit.ly/roggletter) that has over 60 signatories, many of which are businesses along the proposed route. Why would any business along the proposed route be in opposition of this project if there was such great economic benefit? The Sierra Club supports bike paths but not this one. 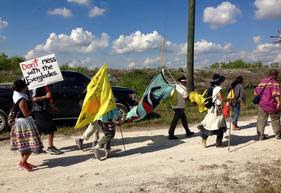 It’s a destructive attack on the Everglades eco-system, tribal residents and precious wildlife. We must RESTORE the Everglades not bring them further harm. 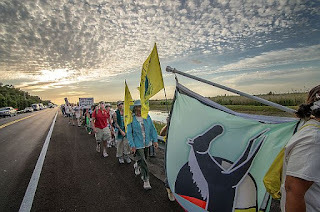 Hundreds of thousands of annual visitors can already enjoy the Everglades safely with the least carbon emissions by using the existing paved and unpaved trails. We do NOT need to build the River Of Grass Greenway.